Auction Steals and Deals Pt. II: Find, Bid, Buy! Everyone knows about eBay, so we won’t go into that here. Another online source that is gaining traction is the estate sale site Everything But the House, where you can look up sales near you and search by the type of item in which you are interested. Just like for onsite estate sales, families contact EBTH about selling a collection. All items are up for auction for 7 days, and all bids start at $1. When the sale closes, EBTH manages payment, pickup and shipping and delivery. Because they are estate sales, and not curated auctions, there are usually a few good items and a whole lot of ho-hum things. Because it is only online, you can’t shake or wiggle anything. But EBTH is definitely a resource to check out. For traditional auctions — where there is a scheduled date, time, and just a minute or two to bid on each item — LiveAuctioneers has long been the major online platform, but BidSquare is up and coming with fewer houses on its roster but all of them reputable. It is good to check both resources, as some houses will list with one online source, but not the other. If you’re looking for something specific, these sites will save search terms for you and send you alerts. I also use both of these sites to figure out which auction houses are within driving distance. Some auction houses have lots of junky stuff that you won’t want to fool with, like whole boxes of smalls sold in a lot, mixed dishes, bad art bunched together, etc. It will take a little weeding, but you’ll find your go-to places and forget about the rest. So you’ve found your nearby auction houses, but you don’t want to spend a lot of time trying to get things you feel you won’t be able to bid enough on to win, do you? Most, not all, auction houses will list an estimate, what they think the piece will sell for based up their past experience. Take a look and you’ll know whether or not it’s worth your time. Sometimes pieces sell for significantly below the estimate, even below the starting bid. You just never know who will be on the floor (or online) and who is interested. You might say, “But I have things to do! I can’t spend all day at an auction!” If you aren’t a dealer, you really don’t need to. (I LOVE to spend a day at an auction. My husband would rather have a root canal.) Every house has preview hours and days. Nowadays, I go to the preview a day or two before the auction, figure out if there is anything I want to bid on, and then I sign up to bid by phone or I fill out an absentee bid form with my maximum bid (one way not to go over budget in the heat of the moment). By phone, I get a call a few lots before mine, and bid when the time comes. With absentee bidding, I won’t hear anything unless I win the item. Sure, I have to go back and pick up anything I win, but I prefer it to losing an entire day. As for online bidding through LiveAuctioneers or through the auction house’s own website, etc., I will take a chance sometimes and bid on small items and art (just got a fabulous painting from Sarasota for an upcoming project) — things that don’t cost as much to pack and ship. 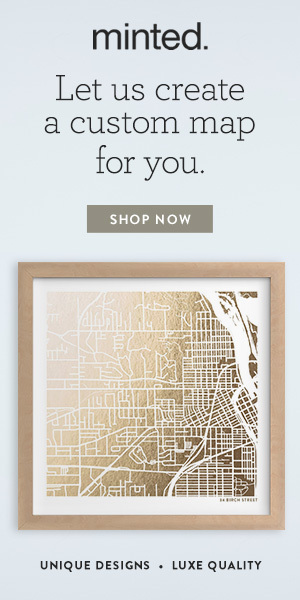 For furniture and rugs, I stay local. It really pays to be able to shake and wiggle things (Please learn from my mistakes! Wiggle things! Slide the drawers in and out!) … and to not have to pay freight. You are trying to save money, after all. Extra Costs — Don’t Be Surprised! The buyer’s premium (BP) is the amount over and above the gavel price that the auction house charges to cover administrative charges. It does not go to the seller. At my favorite auction house here in New Hampshire, the BP is a rock-bottom 10%. It’s the only place I’ve ever seen it so low. Usually it is 20-25% of the gavel price. Also, be aware of state sales tax. Many of you may think, “Of course! Why wouldn’t I be aware of state sales tax? !” Well, for us in New Hampshire where there is no sales tax, it can come as a surprise, if, for instance, we want to buy at auction in Massachusetts or Connecticut. If you find something on LiveAuctioneers.com and Bidsquare.com and the BP is 25%, try registering for the auction directly through the auction house. Usually you will save 2-3% on the BP. Pay by cash or check, and you can save another 2-3%. Doesn’t seem like much, but it can add up, especially if you buy something over $1,000. Lastly, I’ve found some drop dead gorgeous/funky/fabulous/designer/you-fill-in-the-blank amazing pieces all across the country at prices I’ve drooled over. Like this. What has stopped me from buying them all (besides the heart attack my husband would have)? Shipping and packing. Most auction houses do not pack and ship themselves. They contract with a freight company or the local UPS store for smalls. The auction house always lists its preferred shippers. I strongly suggest you call them before bidding on anything!!!!! Give the lot number you are considering. They will assess shipping and packing and call you back. This can add $50-$300 or more to your costs. For that one-of-a-kind item, you’ll have to determine if it’s worth it. I have experience with the following auction houses, either in person or online, mostly because they are in areas where I live or have family. The Northeast is a bastion for English and American antiques. If you’re looking for mid-century and designer items, you’ll have better luck in the Westport and Westchester County area than in northern New England. William A. Smith, Inc. (Lebanon, NH) — This is my local favorite. Legitimate antiques but also estate sales. No sales tax, 10% BP, no online bidding, so be there or be square. Art tends to go high. Thomaston Place Auction Galleries (Thomaston, ME) — Big, multi-day auctions full of fine antiques and art only around big holidays. 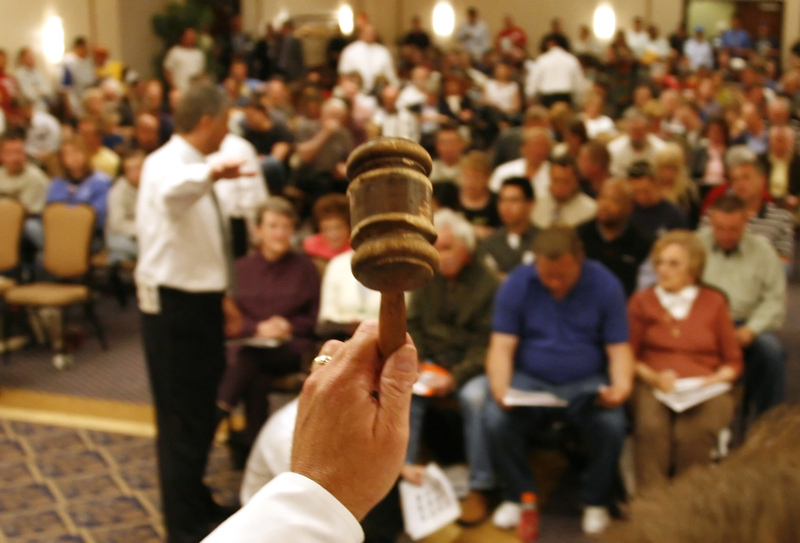 Kaminski Auctions (Beverly, MA) — Monthly estate auctions, as well as holiday weekend ones. Lots of good stuff going for good prices from Boston metro estates. Skinner, Inc. (Boston, MA) — Big themed auctions, e.g. fine silver, rugs, art, Americana, jewelry. 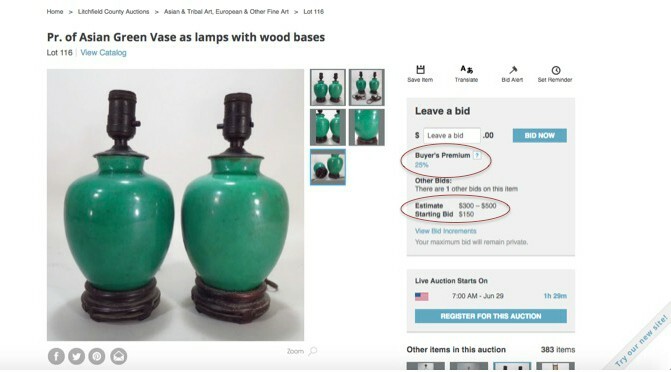 Discovery auctions often feature designer stuff and antiques at affordable prices. Nadeau’s Auction Gallery (Windsor, CT) — Good source for high quality brown furniture. Westport Auction (Westport, CT) — Awesome mid-century to modern auctions. Lots of French influence in the South (especially from estates that bought during the 1950s and 60s — the stuff that’s being unloaded now) so it may not always be up our genX/Millenial aesthetic creek. Some good southern pine and walnut pieces though. Great for crystal chandeliers. I haven’t personally bought from any Florida auction houses (well, except my Sarasota painting), but they can be fantastic resources for Hollywood Regency and Palm Beach chic accents. Neal Auction Company (New Orleans, LA) — AMAZING offerings. Lot of rich people must live in New Orleans! Lots of art, designer, mid-century, and Spanish revival stuff. You lucky stiffs. Clars Auction Gallery (Oakland, CA) — I’ve found some great stuff here. Michaan’s Auctions (Alameda, CA) — Annex auctions highlight items that may have gone unsold for a while and are now offered at rock-bottom starting bids. So there you go! My guide to buying good stuff at auction. That was a ton of info, but I hope it was helpful! What do you think? Thoughts? Questions? Can I shop for you?????? Next week, a crisp summer palette for interiors with inspiration from the glories of our great Granite State. Stay tuned!